← How to convert documents of Microsoft Office PowerPoint to XBM? How to convert MS Office PowerPoint documents of PPT to JPEG? If you want to convert ppt to jpeg or convert pptx to jpeg, docPrint Document Converter Professional will do you a great favor. Because docPrint Document Converter Professional is a professional document converter. docPrint Document Converter Professional is a software product that dynamically converts MS Office 97/2000/XP/2003/2007, WordPerfect, AutoCAD DWG, PostScript, Adobe Acrobat PDF and many other document types to Adobe Acrobat PDF, PostScript, EPS, XPS, PCL, JPEG, TIFF, PNG, PCX, EMF, WMF, GIF, TGA, PIC, PCD and BMP etc formats. With docPrint Document Converter Professional you can convert your documents from and to 50+ formats easily. There are three available applications in docPrint Document Converter Professional which is also called as docPrint Pro. They are GUI application, command line application and virtual printer application which is to be introduced in this article. The virtual printer docPrint acts not only a Windows printer, but also a document converter which can realize many functions. To use docPrint, you should download docPrint Pro at http://www.verypdf.com/artprint/docprint_pro_setup.exe for free. After installing docPrint Pro on your computer, you can see docPrint in the printer list by clicking “Start”—“Printers and Faxes”. 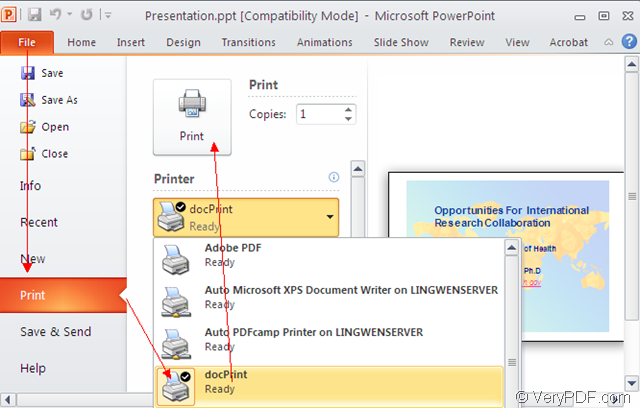 The following contents will show you how to convert ppt to jpeg with docPrint in details. 1. 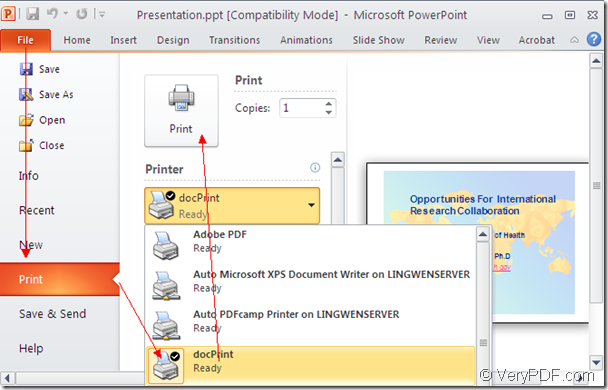 Please open a PPT document and click “File”—“Print” to open “Print” dialog box in which you can choose “docPrint” as your printer in “Printer” combo box. Then click “Print” button. 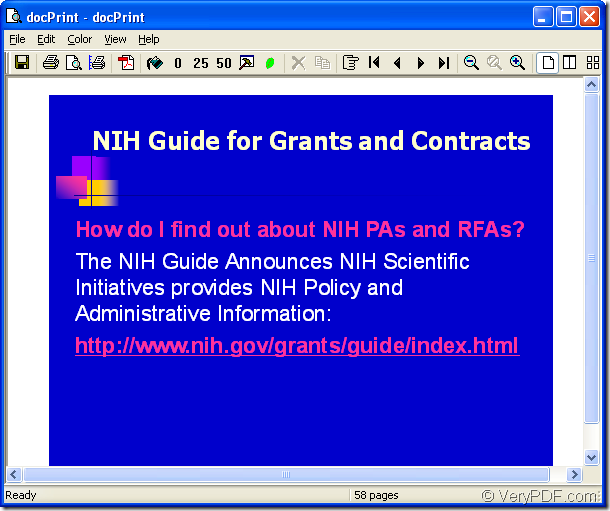 Please see Figure1. The “Print” dialog box can also be opened by the hot key “Ctrl”+ “P” combination. If docPrint is the default printer, you can right click the PPT document and choose “Print” option to skip the “Print” dialog box. 2. In popup “docPrint” dialog box showed in Figure2, you should open “Save As” dialog box in which you can save the target files and run the conversion from ppt to jpeg. Please use the following methods to open “Save As” dialog box. You can click “File”—“Save as” or click the “Save File” icon in the toolbar. You can also press “Ctrl”+ “S” on the keyboard at the same time. 3. 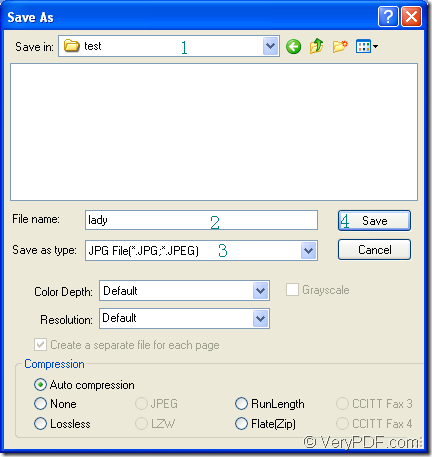 Then you will see the last dialog box—“Save As” dialog box in the conversion from ppt to jpeg. Some operation must be done to complete the conversion. Please see Figure3. Firstly, please specify the location for the target files in “Save in” combo box. Secondly, you should input the name for the target file in “File name” edit box. 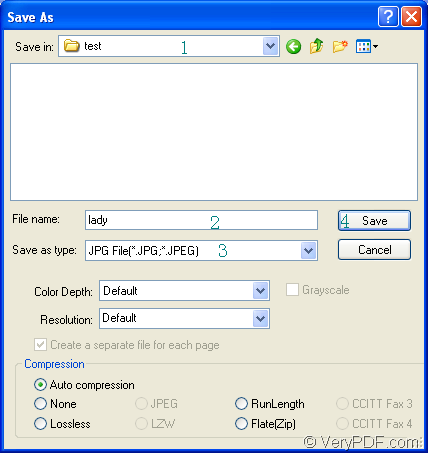 Thirdly, you should choose the file type for the output files in “Save as type” combo box. Lastly, please click “Save” button to run the conversion. A green progress bar will appear at the bottom of “docPrint” dialog box and it will be empty again when the conversion is over. Please check your target files in specified location with some image processing or editing programs. To learn more information about docPrint Pro, please visit its homepage at http://www.verypdf.com/artprint/index.html. How to convert documents of Microsoft Office PowerPoint to JPEG? How to print PowerPoint documents of pptx to jpg? How to convert MS Office Excel documents of XLS to SVG? How to use docPrint PDF Driver printer to convert a Word document to EPS format? How to convert files of AutoCAD to wmf? This entry was posted in docPrint Pro and tagged ppt to jpeg, pptx to jpeg. Bookmark the permalink.